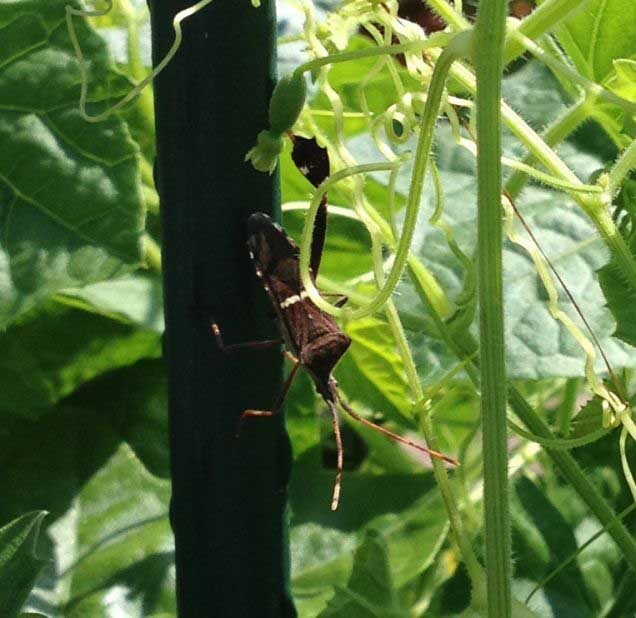 Often mistaken for assasin bugs, these critters feed on your fruit! Leaf footed bugs (Leptoglossus spp.) get their name from the wide leaf-like structures on their legs. Adults emerge in spring and are often most abundant in summer. You'll often find them perched in your vegetable garden or fruit & nut orchards. Leaf footed bugs will feed on flowers, fruits and seeds with their piercing mouth parts. In the photo, you'll see the insect perched on cucumber plants near a developing fruit. If you don't have a large infestation, you can often hand pick insects off of your plants. But be warned, these bugs are members of the stink bug familly: Hold them too long and your nose won't thank you! There are several species of leaf footed bugs: The one in the photo is most likely Leptoglossus phyllopus.